Spark Microgrants is currently working with many communities in Rwanda. As a facilitator, I am working with the Gisagara community which in a rural area located in the southern province, Gisagara District. In the community, many of the community members grow crops like maize, beans and cassava and also make clay pots. Talking to people that live in this community, the pots that they make are very cheap in comparison to the time and effort they spend making them. Some communities in Rwanda are facing challenges such as food insecurity, access to clean water, and problems caused by lack of hygiene. Spark Microgrants is helping this community to create a sustainable solution to one of the biggest challenges they identified, which is the problem of food insecurity. The process of selecting this project was done by the community itself when they were divided into three groups to discuss sustainable solutions for the food insecurity. Each group had a different solution like growing pineapple, breeding animals such as pigs and goats, growing cassava. After discussing together, each group explained to the other members of the community why they prefer their project. For those that chose to breed animals, the reason for them was the benefit manure, but they were convinced that these animals can’t be as productive as they'd hope. Those that chose to grow pineapple were convinced by the others that pineapple is good, but according to the problem of food insecurity, they shouldn’t plant pineapple because they will have to wait for a long period to solve the problem of food. Finally, the cassava group successfully convinced everyone in the community that cassava is good for the climate of the Gisagara region. In terms of making money, they assured Spark that they have a market where cassava is expensive so that they will sell it at a good price. Moreover, after this discussion, they realized that cassava is a good crop for the community because it is productive and can be sold at a good price at 180 Rwandan francs per kilogram. They also have an idea of how they can store the harvest by wetting the cassava in water and then drying it in order to transform it in flour to make cassava posh. After agreeing on this project of planting cassava, the next step was to think about how they can implement the project. They drafted a proposal that included a budget, materials they will need for the project and how they will manage the harvest, which is very important as it ensures the sustainability of this project and how the project will solve the problem of food insecurity. This community was further united as they discussed together as members of the community and decided that what they will rotate cassava with pineapple and rent another piece of land to continue with cassava. People in Gisagara hope that this project will not only help them to overcome the problem of food insecurity, but also they will be able to afford medical insurance. 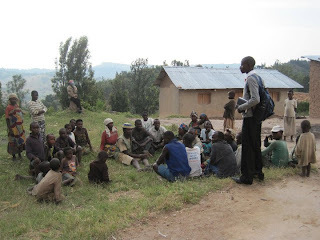 The community of Gisagara is composed of 87 members both men and women who are willing to work as community to develop their families and they are starting the project on 3rd October 2011. Thank you Claude for your impressive work in Rwanda helping communities to live healthier. Thank you again for this article. It is very excited to listen to how people of Gisagara are fighting against Hunger. Claude, thank you so much for this post! Your dedication is incredible, and I am very excited to hear more about the grant once it is implemented.